Starting from v6.5, DevNullSMTP has been integrated with Xeams. 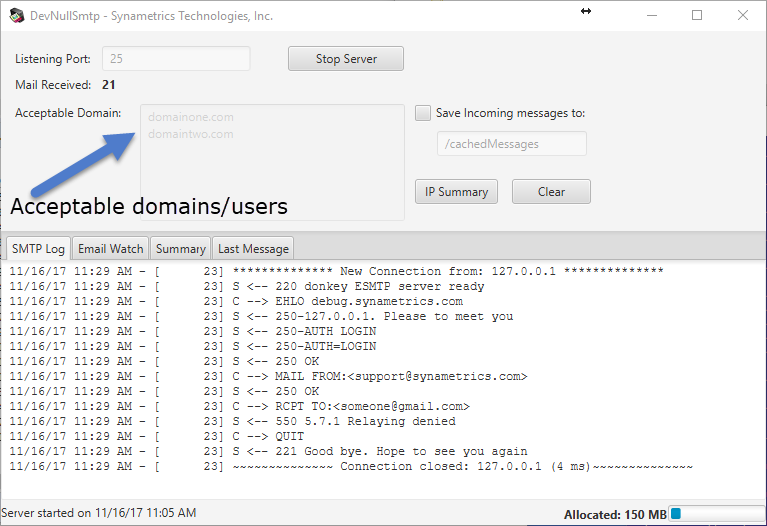 Follow the steps below to add recipients for DevNullSMTP. Important Note: There is no need to restart Xeams after modifying the file. By default, DevNullSmtp will run as an open relay - meaning it will accept messages for every domain and users. The log shows an incoming email that was supposed to be delivered to someone@gmail.com. It was denied by DevNullSmtp is not configured to accept emails for that domain. Check Save incoming messages to box and specify a path on the local machine if you want to save incoming messages.